Everything that's supported in the 0.14.1 version of the default VuePress theme is supported on Yuu. Updates will be made occassionally to try to keep up with the default's themes features and CSS and etc. Below is a list of the additional configurable features Yuu has to offer. Yuu, by default, comes with an option to allow users to switch to a dark theme. You can disable this via the disableDarkTheme option. 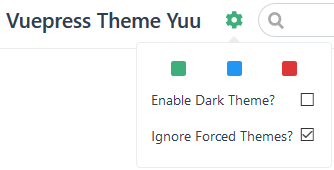 Yuu currently supports 3 color themes: the default (green) theme, a blue theme, and a red theme. By default, any additional themes will be included. If you only want to use certain themes, you'll need to be explicit about which ones. Users will still be able ignore forced themes via the user settings dropdown menu. You can disable this via the disableThemeIgnore option.